Sara Haines, co-host of ABC’s “The View,” pleaded with Chelsea Clinton on Wednesday to reconsider running for political office. “Well you said you’re not interested in running for a political office, but your political tweets do give people hope,” Haines said, in reference to Clinton’s tweets which have gotten increasingly snarky and political in the past couples of months. 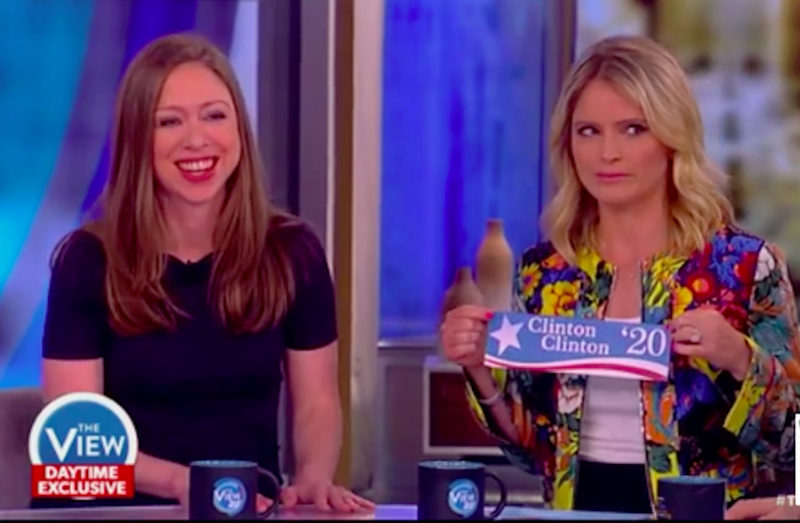 “Is there anything that would change your mind?” Haines begged as she handed her a sticker that read “Chelsea Clinton ’20.” The screen on the set behind them mirrored the same political signage. In the same interview, Joy Behar asked Clinton how she helped her mom to cope with it the “devastating loss to the country” after she lost the presidential election to Donald Trump last November.